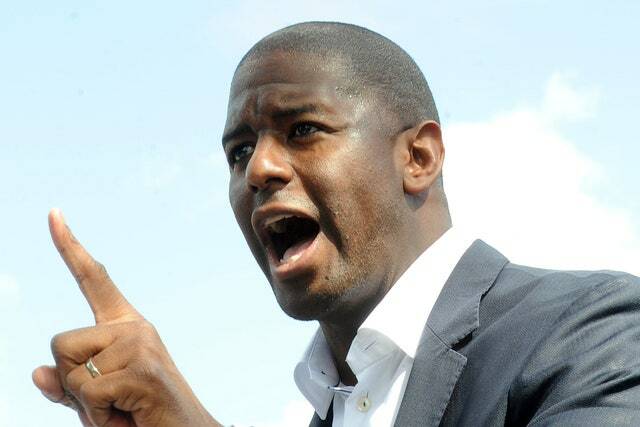 Andrew Gillum reminds me of RFK and MLK. He speaks truth to power and GQ Magazine says that he understands the Republican Party better than any other Democrat. Florida will be blessed to have Andrew Gillum as Governor. Vote between now and November 6 for Andrew Gillum, Bill Nelson, Nancy Soderberg and the rest of the Democratic ticket. Vote like your life depends upon it, because it DOES. He's willing to call a spade a spade and more politicians should follow his lead. For Democratic politicians across the country, Andrew Gillum is a model to follow. And not just for his campaign necessarily, but for his willingness to call out the smokescreened racism of his opponents. After a week of rightwing politically-motivated violence, the Florida gubernatorial candidate accused his opponent, Ron DeSantis, and Donald Trump of empowering that violence. Per NBC News, at a campaign event Tuesday, Gillum said DeSantis and Donald Trump are waging "a campaign that is providing cover for people who are now taking their political differences and going to the next extreme to create political violence." He added: "This bomber, here in the state of Florida, had a hit list of 100 people. He sent bombs all across the country targeting prominent Democrats who have criticized the president. And these folks think they bear no responsibility for that." Racism has thrived in American politics in recent decades thanks to doublespeak that lets it pass in polite conversation. But with the rise of Trump, public figures have gotten lazier with their coded language, more brazenly flirting with overt racism and anti-Semitism even while they furiously object to those labels. ("A hit dog will holler," as Gillum said.) The Democrats so far haven't been able to keep up, acting like U.S. politics is still a polite parlor game and not a breeding ground for mass shootings at synagogues and black churches. Iowa Congressman Steve King is the most egregious example. On immigration, he's said that "we can't restore our civilization with somebody else's babies," and when asked for clarification responded, "I meant exactly what I said." Since the shooting at Pittsburgh's Tree of Life synagogue, King has come under fire for an August meeting with an Austrian political party founded by a former Nazi SS officer. He told the group that "Western civilization" is in decline because of immigrants and blames George Soros. Since the shooting he's denied that he's anti-Semitic, but defended the allegedly neo-Nazi groups he affiliates with by saying, “If they were in America pushing the platform that they push, they would be Republicans.” And he's probably right, though that doesn't do him any favors. Texas senator John Cornyn is a much more respectable Republican figure than King, but his response to the Pittsburgh shooting was to tweet a context-free quote he pulled from a Nancy Pelosi interview in an attempt to make it look like Democrats instead of Republicans are the party encouraging political violence. In reality, Pelosi was talking about the economic policy and has historically, like Chuck Schumer, taken a very milquetoast, hand-wringing position on even nonviolent protests. And for aspiring politicians, coy anti-Semitism still looks like a winning strategy.